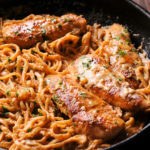 Creamy Chicken Pasta in Mozzarella Cheese Wine Sauce - What's In The Pan? Chicken Pasta with Sun-Dried Tomatoes and Spinach is cooked in a deliciously creamy mozzarella cheese wine sauce, while paprika and garlic flavor all the ingredients in this spinach pasta dish. Done in under 30 minutes, it’s as easy as it is tasty! 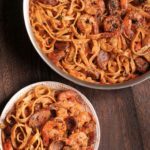 If you love simple pasta dishes, you will love making this dish! Everything comes together to create a deeply satisfying dish. All you need to do is to saute some sun-dried tomatoes in olive oil, then cook the chicken, seasoned with salt, pepper and paprika, in the same flavorful mixture. After the Mozzarella Cheese Wine Sauce is prepared, the chicken and sun-dried tomatoes are returned to the skillet before adding pasta. Simply add equal amounts of wine and heavy cream to onions and garlic sautéed in butter; and simmer for a couple of minutes, then add Italian seasoning, salt and Mozzarella Cheese! Use any dry white wine, such as Pinot Grigio or Chardonnay. Penne is a great choice for this dish. Rigatoni would also work quite well. It’s a good idea to heavily salt the cooking water for the pasta to give it most flavor. 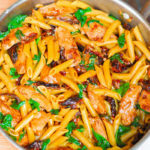 This hot and creamy chicken penne with sun dried tomatoes and spinach dish is so perfect for a homemade pasta dinner and it will definitely fill you up if you’re feeling hungry these days. A glass of wine with it is always welcome. Sun-dried tomatoes, garlic and mozzarella is a divine combination. So simple and so tasty! Follow me on PINTEREST and FACEBOOK to get more recipe ideas! 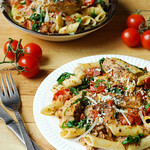 Chicken Pasta with Sun-Dried Tomatoes and Spinach is cooked in a deliciously creamy mozzarella cheese sauce. 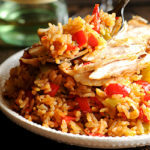 Done in under 30 minutes, it's as easy as it is tasty! In a large skillet, add olive oil and heat it over medium high heat. When the pan is hot, add sun-dried tomatoes and sauté for about 2 minutes to soften them. Remove tomatoes from the pan. Add sliced chicken breast, season it with salt and pepper and paprika. Cook on medium high for about 4 minutes on each side until browned. Remove the chicken onto a plate. Add butter, onion and garlic cloves to the hot pan. Cook on medium high until onions and garlic are translucent, about 2 minutes. Add 1 tablespoon flour to pan and whisk to combine. Add 1 cup heavy cream, 1 cup wine, 1 teaspoon Italian Seasoning, 1/2 teaspoon salt. Bring mixture to a simmering point. Simmer for 4-5 minutes. Remove from heat and add mozzarella cheese, stirring until blended. Taste the sauce and add more seasoning, if necessary. Add spinach to the mixture and allow it to wilt. Add the chicken and sun-dried tomatoes back into the pan and mix everything well. Taste again and add more seasoning, if necessary. Cook pasta according to package instructions in salty water. 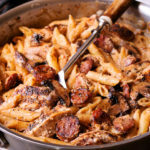 Drain pasta and add it to the skillet with the sauce and chicken. Mix pasta well into the sauce to make sure it's well coated. This was such a hit with a family! Everyone agreed that it tasted like a restaurant style dish. Great recipe! Thank you Natalie, I’m glad you enjoyed it.